Gosh, things are buzzing at the Chester County Commission this week! There was the application deadline for the interim County Commissioner position vacated by Carol Aichele, who left for a job in Gov. Corbett’s administration. The deadline was Monday, January 30 at 12 noon – but at the close of business on Friday, there were zero applications received at the Common Pleas Court of Judges. An article appeared in the Sunday edition of the Daily Local advertising the fact that there were no applications. Apparently, the notice did the trick and created a last-minute crush of interest! By the 12 noon deadline on Monday, there were 39 applications received for the vacancy! Upon review, six were removed from consideration because the applicants were Democrats and the appointment will go to a Republican. Although the judges hope to shorten the list, it looks like the interview process is going to be quite the undertaking! Another item out of the County Commissioner’s Office. . . there is some unsettling news circulating about Republican Commissioner Terrance Farrell’s re-election campaign. This past November, he held a kick-off fundraiser, “A Pint of Chester County” for his campaign. The emailed invitation encouraged recipients to become sponsors with a suggested donation range of $250 – $2,500. When I received Farrell’s invitation, I found it curious that I was on his email list. Never having donated to Farrell and not knowing how they had my address, I emailed Farrell’s campaign but never received a response. Today, I learned that my receiving Farrell’s email invitation was not an anomaly and some people are none too pleased, including State Sen. Andy Dinniman (D-Chester). Farrell’s fundraising email invitation was sent to government and personal email addresses, including Sen. Dinniman. Farrell emailed the fundraiser invitation to Sen. Dinniman’s district office. Senator Dinniman’s staff sent Mr. Farrell’s campaign a letter stating that he was allowed to send political mail to a state senate office. Dinniman reported that his office received complaints by at least three other individuals, all Democrats complaining that Farrell had sent them the fundraising invitation to personal email accounts. Farrell’s response to accusations of misusing emails for his re-election campaign — he was just keeping his constituents informed. Whoops! Things are really getting interesting for county races . . . from DA candidates to the Common Pleas Judge candidates and now the news about the County Commissioner candidates. It will be curious how the hyperbole plays out at the County Republican Convention on February 15. Speaking of politics . . . so, you think you know where you stand, politically speaking? Think again. A friend sent me this short test and the results may surprise and give you food for thought. You will be asked just 10 questions, and it instantly tells you where you stand politically. The results will show your position as a red dot on a “political map” so you will see exactly where you score. The most interesting thing about the quiz is that it beyond the Democrat, Republican, and Independent. I took the test and was not surprised to score a ‘Centrist’ label for my efforts. According to the Quiz website, . . . “a Centrist prefer a ‘middle ground’ regarding government control of the economy and personal behavior. Depending on the issue, they sometimes favor government intervention and sometimes support individual freedom of choice. Centrists pride themselves on keeping an open mind, tend to oppose “political extremes,” and emphasize what they describe as “practical” solutions to problems”. Just yesterday, it was announced that Gov-elect Corbett had selected Carol Aichele to serve in his cabinet as Secretary of the Commonwealth. Today we learn that Carol will be able to carpool to Harrisburg with another Aichele family member. Corbett has selected Carol’s husband, Steve Aichele, to serve as the state’s Chief Counsel. Chairman and Chief Executive Officer of major Philadelphia law firm, Saul Ewing, Corbett will oversee the Commonwealth’s legal department which employs 500 attorneys and represents the governor and 32 executive and independent agencies. Epitomizing the phrase, ‘all in the family’, Carol and Steve Aichele are certainly Malvern’s newest power couple going to Harrisburg. Today it was announced that Gov-Elect Corbett has named Carol Aichele, Chester County Commissioner to his cabinet. Carol has been named the new Secretary of the Commonwealth. This position is responsible for overseeing the state’s election system and monitoring 800,000 licensed business and health professionals. In his praise of Aichele, Corbett spoke of her role in securing three Triple A bond ratings to Chester County for its financial management practices. Her appointment must be confirmed by the state Senate. Great Valley resident, Aichele has served as one of the three-member Board of Commissioners of Chester County since her election in 2003. She was re-elected to that post in November 2007. Her current term runs through 2011 so presumably, there will need to be a County Commissioner appointed to fill the vacancy. Any suggestions? 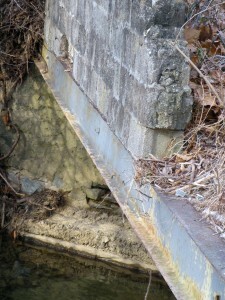 Deteriorating bridge, parking safety concerns, liability issues . . . Why spend taxpayer money on open space and not maintain? 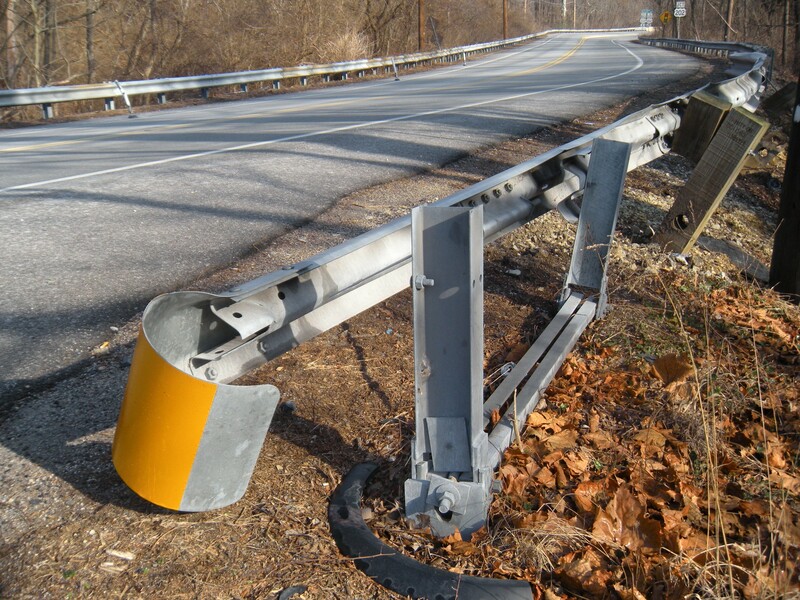 Back on November 15, the Tredyffrin Township’s Board of Supervisors agenda included awarding the Swedesford Road Open Space bridge repair contract. (The lowest qualified bidder was Bill Anskis, Inc. in the amount of $84,655.50.) 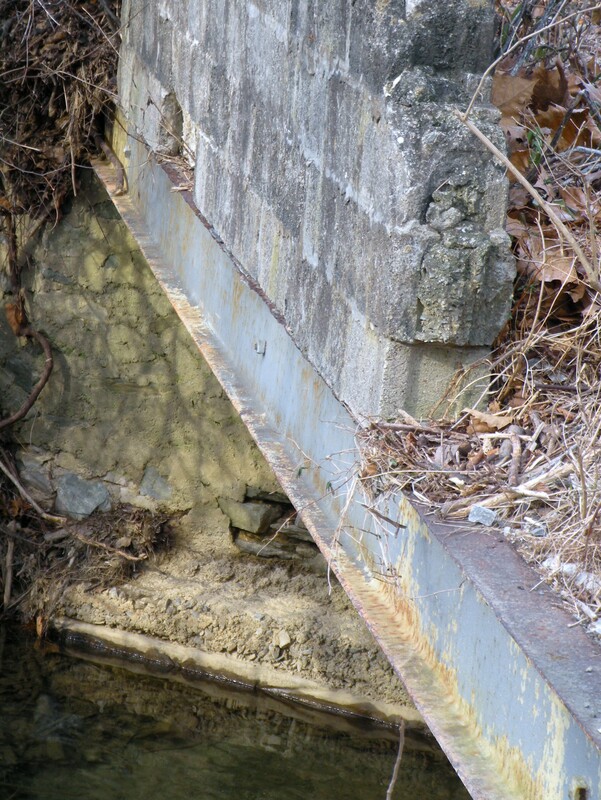 This bridge repair has been on the Township capital projects list for a long time and had finally found its way to the top. The Swedesford Road Open Space property is located directly across the road from my house, so I am acutely aware of its usage and its associated parking issues for anyone attempting to use this Township open space. I spoke at the November 15 supervisors meeting to explain the Swedesford Road Open Space usage, particularly during spring and summer trout fishing season. Swedesford Road is a highly traveled road and I assumed that once the liability issues to the township were understood, this project would move forward. In fact, in the township’s five-year plan, improvements to the Swedesford Road Open Space project specifically state, “bridge and parking lot safety improvements”. Additionally, the necessary repairs needed for the Swedesford Road Open Space bridge and parking improvements is included in the implementation of the latest Township Comprehensive Plan. Rather than approving the Public Works project, the supervisors voted to pass it to the Parks Board for further discussion. The Parks Board met last week and the Swedesford Road Open Space bridge project was on their agenda for discussion. It is my understanding that the Parks Board voted unanimously not to support the bridge repair and parking safety project. I simply do not understand. Either the members of the Parks Board did not visit the Swedesford Road site (and see the deteriorating bridge and existing parking liability issues) or they are choosing to follow the lead of some of the supervisors. But it does surprise me that members of the Parks Board would not support the needed repairs and maintenance of one of the parks they are appointed to protect. As an appointed member of the township’s HARB (Historical Architectural Review Board), I liken their decision to . . . me not supporting the historic buildings in the township. I guess I do not understand the Parks Board motivation. If the township (1) supports open space through purchase of property and (2) advertises the use of the open space and parks, then (3) doesn’t the township have a responsibility to maintain the property so that it is accessible and safe for the residents to use? Back in 2006, there was a firestorm of debate over the purchase of the Swedesford Road property (and its price tag). The purchase price for the 5.7 acres of open space was $825,000. However, a Chester County grant paid for more than half the cost. The Swedesford Road Open Space ordinance in 2006 stated the property was to be “utilized perpetually for park, recreational and natural-resources conservation purposes.” Many in the community thought that the price was too high for this property but that debate is long gone . . . the taxpayers own the property and it should be accessible for use. It is also important to note that the Swedesford Road Open Space project is a capital expense and not included in the township’s operating budget. 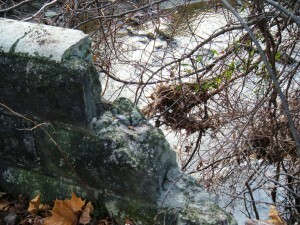 The project is funded through bond and grants money and would not affect the supervisor’s passing of the 2011 budget. 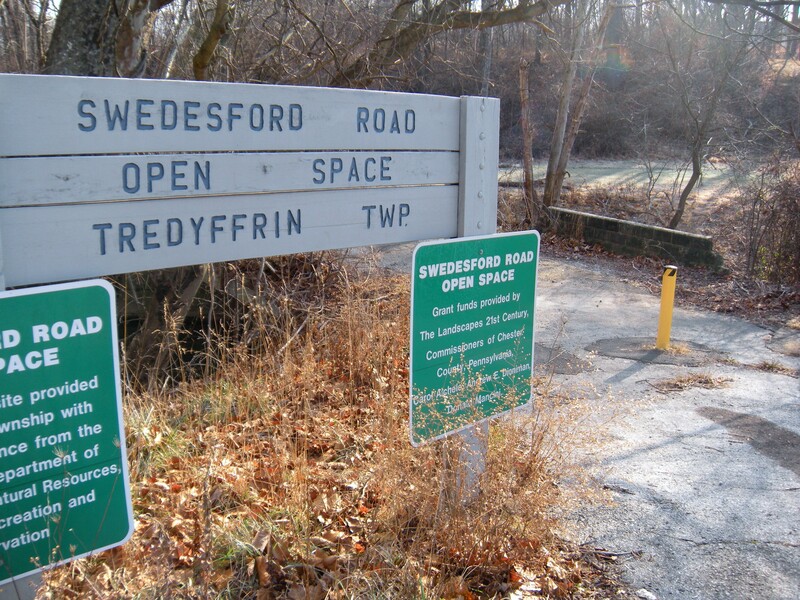 In reviewing the agenda for the upcoming Board of Supervisor meeting on Monday, the Swedesford Road Open Space bridge repair and parking improvements is listed. With the reinforcement of the Parks Board member’s unanimous vote not to move the repair project forward, it is doubtful that the supervisors will approve this Public Works project. I do hope that the supervisors recognize that there is a liability issue for the township by choosing not to repair the bridge or improve the parking situation. 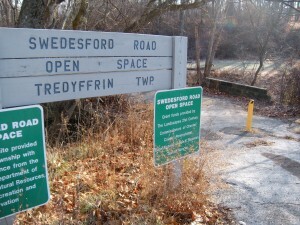 Residents see the township’s sign ‘Swedesford Road Open Space’ and attempt to pull off the road on to the open space property. With no room to turnaround, drivers are often forced to back out on to Swedesford Road . . . a risky proposition! If the supervisors are not going to repair the bridge and improve the parking, I suggest that the township remove signage and close the area of Swedesford Road Open Space to discourage visitors. However, before taking down the Swedesford Road Open Space sign and closing the area to public use, perhaps the township supervisors should notify Senator Andy Dinniman and Commissioner Carol Aichele. Chester County dollars through a grant were used to fund this open space purchase and their names appear on the sign! 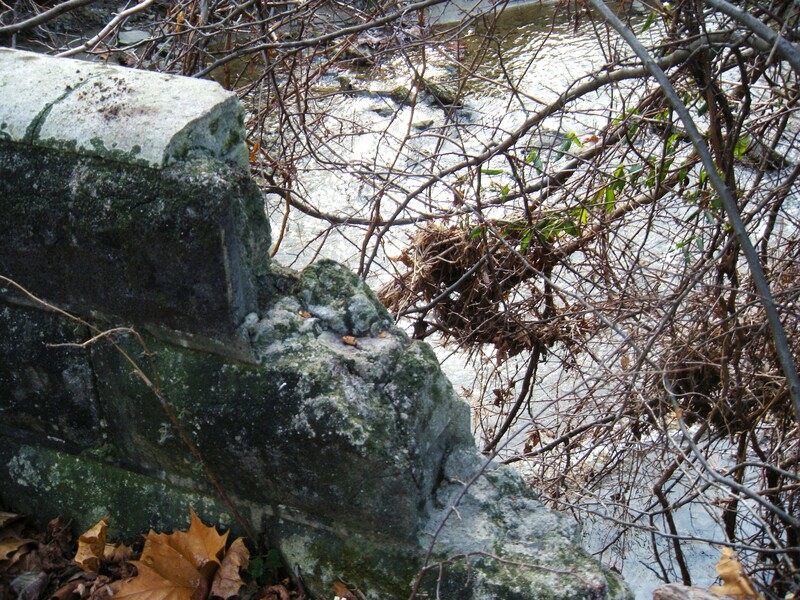 Following the November 15 Board of Supervisors meeting, an article, ‘Tredyffrin has its own bridge to nowhere’ appeared in the Mainline Media News newspaper – here is a link. For those that are unfamiliar, I have included some photos of the Swedesford Road Open Space property – the bridge and the parking area. In the last few weeks, there has been a traffic accident at the Swedesford Road Open Space where the guard rail has become dislodged. Here’s some interesting news from Harrisburg over the last couple of days. If you recall last week, there was news that newly elected and returning legislators will get a 1.7% cost-of-living pay raise starting December 1, when the new Legislature opens for business, even though they won’t be sworn in until January. Many elections won by candidates based on fiscal conservatism, amid high unemployment numbers and screams to stop the spending, a pay raise discussion at this time was causing quite a stir by tax-payers. Yesterday, Auditor General Jack Wagner called for a moratorium on the scheduled 1.7% cost of living adjustment for public officials. He is asking that this be the first action of the new General Assembly in January – putting a moratorium on the 2011 increase. He further states that the moratorium would save the state $3 million in 2011 and save $12 million over the course of the next 4 years. Hope that our local officials will support the Auditor General on the moratorium. Every little bit helps and this is the right signal to send to Pennsylvanians! Second bit of interesting news from Harrisburg. Governor-elect Corbett has put together a transition group of more than 400 business leaders, conservative activists (including 2 Tea Party people), veterans of past Republican administrations, legislators and is said to have included even a few Democrats. The members will serve on 17 transition committees, which will examine 25 departments and agencies in state government. They will help Corbett choose his Cabinet members. Why is this interesting to Community Matters? One of Tredyffrin’s own was named to the transition team. Malvern resident and Chester County Commissioner Carol Aichele was named as the co-chair of Corbett’s ‘Local Government Committee’ and also as member of the Commonwealth Committee that will look at the Office of Administration and Department of General Services. Some suggest that by serving on the transition team, members may have an inside track to Cabinet positions. So, next question – wonder if the next step will have Carol heading to Harrisburg as a Cabinet member? The third recent item from Harrisburg that caught by eye has to do with Governor Rendell. Apparently Rendell is planning to issue an additional $1 billion in bonded debt before leaving office! If Rendell pulls this off, it will be history making as the largest lame duck spending proposal in Pennsylvania’s history. If approved, the $1 billion new debt will actually cost the state’s taxpayers more than $1.6 billion over the next 20 years in the form of annual debt service payments of $82 million. However, this proposal would require the approval of both the governor and either the Auditor General (Jack Wagner) or the State Treasurer (Rob McCord). Based on Wagner’s statement about fiscal responsibility and the moratorium on the 1.7% cost-of-living increase for state officials, it is no surprise that he does not support Rendell’s proposal. Treasurer McCord is the tie-breaking vote. However, before he makes a decision McCord is asking the advice of Governor-elect Corbett. The state is facing a $4 billion+ debit next year, so this new proposal would challenge the state further, to more than $9 million. As a historic reference point, in June 2002, the state held $6.1 billion in debt, which has since increased to $8.4 billion, a 39% increase. For the record, the new debt would only cover projects which are already in progress or that the state had contractually agreed to complete. It is possible that if funding were not provided for the contracted projects, developers could bring lawsuits against the state for breach of contract. $400M public improvement projects (things like new state prisons, flood protection projects, high hazard dam repairs, renovations of state park facilities, renovations to military facilities and veterans homes, renovations to higher education facilities. $200M in bridge repair projects for structurally deficient bridges across the state. $155M of the proposed $1B is for Redevelopment Assistance Capital Program (RACP) projects. Those RACP projects are for previously approved projects that have gone through the application and contracting process already and are for RACP projects currently under construction. $114M in funding for transportation assistance projects to the local transportation agencies for upgrades and repairs to mass transit, rail freight projects and aviation projects. $76M for Pennvest grants and loans for repairs and renovations of local water and sewer infrastructure. $30M for Growing Greener II projects for environmental reclamation and preservation projects. $25M for Pennworks grants and loans for repairs and renovations to water supply and wastewater treatment projects at the local level. Chester County Commissioner Carol Aichele said last night that she was ending her bid for Lieutenant Governor, just days before the state Republican Party meets to make a formal endorsement next weekend. Aichele made her announcement in an e-mail to supporters late Sunday night. Her decision came shortly after the completion of regional straw votes. If memory serves me correctly, I think that there have been 5 GOP straw polls held over the last few weeks. Although straw polls are not binding, they are an indicator as to where the party is leaning. I guess we can assume that Carol’s decision was based on her showing in those votes. I wanted to thank all of you for your support and encouragement during my campaign for Lieutenant Governor. From the Poconos to Pittsburgh and from Erie to Philadelphia, it has been my honor and privilege to meet with countless Republicans who share my determination to create a new beginning for Pennsylvania. While I truly enjoyed this time in my life, I wanted to let you know that I will no longer be a candidate for Lieutenant Governor. Since I entered this race last June, my number one priority has always been to help Tom Corbett become the next Governor of Pennsylvania. Even though I will no longer be a candidate for Lieutenant Governor, I remain committed to this priority. I will do everything I can to help Tom and will work so that he will win Chester County by the largest margin possible. I believe it is imperative that we unite behind Tom and that our party endorse one candidate for Lieutenant Governor. Unnecessary and expensive primary campaigns will only hurt our chances of defeating the Democrats this fall. So to all my fellow Republicans, state committee members, party leaders and fellow Lieutenant Governor candidates, I want to thank you again for the time we spent together during this journey. Your support, encouragement and well-wishes will never be forgotten. 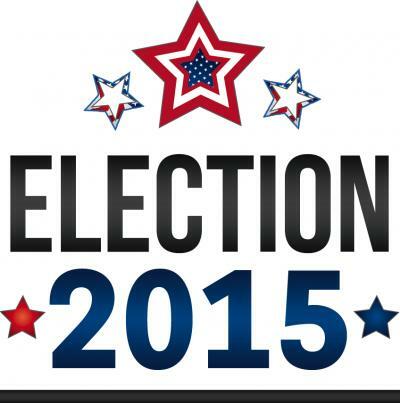 How Did the Lieutenant Governor Straw Poll Go for Tredyffrin Resident Carol Aichele? Yesterday in Harrisburg, the Republican Central Caucus held its first straw poll vote for GOP lieutenant governor candidates; 104 votes were taken. How did our local GOP candidate Carol Aichele do? The downside for Commissioner Aichele was that she did not lead the vote count; businessman Chet Beiler (29 votes) from Penn Township narrowly edged out Dauphin County Commissioner Nick DiFrancesco (26 votes). However, the upside of the straw poll is that no candidate received even 30% of the central vote in this first of 6 straw polls across the commonwealth. But remember the straw poll is not binding and it is probably too early to read too much into yesterday’s results. Chester County Commissioner and Tredyffrin Township resident Carol Aichele is on the candidate list of Pennsylvania Lieutenant Governor hopefuls. She is on a list that includes as many as a dozen Republican candidates who have expressed an interest in Pennsylvania’s second-in-command position. How does a candidate try to position his or herself as a frontrunner as the candidates start to look ahead to the May primary. . . ? The GOP is holding six non-binding straw polls throughout the commonwealth starting tomorrow in Harrisburg. All meetings will take place before the February 13 state Republican Party Committee when historically an endorsed candidate is announced along with a US Senate and gubernatorial candidate. There is some talk that with such a long list of candidates the solution could be an open primary on May 18. However, tomorrow the non-binding straw poll will begin to help the State GOP sort out their favorites among the large pool of hopefuls, all jockeying for frontrunner positioning. Here is the latest list of the top 10 GOP Lieutenant Governor candidates. State Rep Tom Killion of Delaware County was on the Republican candidate list for Lieutenant Governor but dropped out of the race today. Steve Johnson, York; founder/CEO of Homecheck, Inc.